The Port City of St. John’s is the most easterly port in North America and closest point of land to Europe. Due to its strategic location, St. John's has been vitally important for centuries for explorers, adventurers, merchants, soldiers and all manner of seafarers. A variety of cruise lines include St. John’s on their itineraries as both a home port and in-transit port of call. 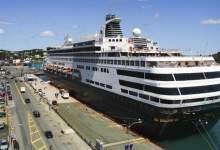 St. John's has become a home port for cruise ships on a variety of itineraries that cruise Newfoundland and Labrador and the Canadian North. As well, St. John’s is a regular port-of-call for cruise vessels on itineraries travelling North Atlantic, transatlantic and northeastern seaboard routes. The City of St. John’s together with the St. John’s Port Authority work with other partners in the development of the cruise industry.